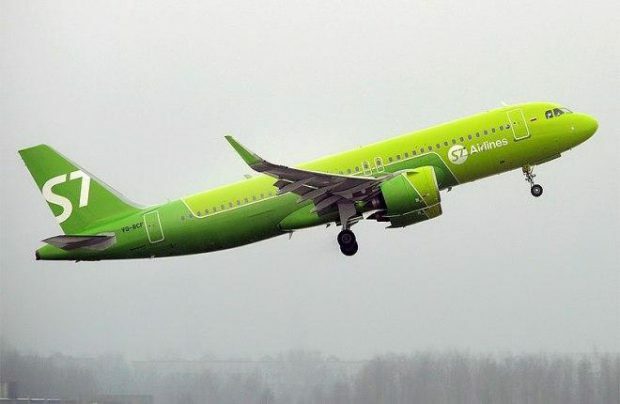 Russian air carrier Sibir (which trades as S7 Airlines) registered a 10.3 per cent growth in net profit in Q1 2018, up to 160.2 million rubles (US$2.7 million), according to the company’s Russian Accounting Standards financial statements. The airline’s revenues in January-March climbed to 24.3 billion rubles (US$412 million), a 17 per cent year-on-year improvement. Gross profit dropped by 4.9 per cent to hit 1.434 billion rubles, as profit from sales shrank by more than twice, down to 215.1 million rubles. Russia’s second biggest carrier transported 2.299 million passengers in the January-March period, a 16.8 per cent improvement on the same three months of 2017. In the period, S7 managed to demonstrate positive financial results despite a fuel price hike, the airline’s representatives point out. Although the company’s long-term liabilities rose to 24 billion rubles as of March 31, 2018, compared with 21 billion at the end of 2017, the current liabilities dropped from 27.9 (end of 2017) to 21.7 billion rubles (March 31, 2018). In 2017 as a whole, S7 Airlines saw net profits reach 4.4 billion rubles, a 1.5-fold improvement on 2016 when the company’s net profit tripled. Last year, the airline’s revenues grew to 117.7 billion rubles, 8,9 per cent up on 2016. “The growing retail price of aviation fuel remains a main risk for Russian airlines: last year jet fuel prices went up by 16 per cent across the country, to hit 47,900 rubles-per-tonne; and by 22 per cent in the Moscow airports cluster to 45,100 rubles-per-tonne,” reveals the the company’s report in reference to Rosaviatsia’s (Russian aviation authority) official statistics. “In order to decrease the long-term impact of risks related to such fuel price fluctuations, we are working to reduce the exposure of the company’s operational efficiency to such volatility in the raw materials market. Renewing the fleet with fuel-efficient, foreign-made aircraft, along with a transition to direct fuel procurement, allows for the enhancement of better overall fuel efficiency and minimises the effects of fuel price growth,” the company states.